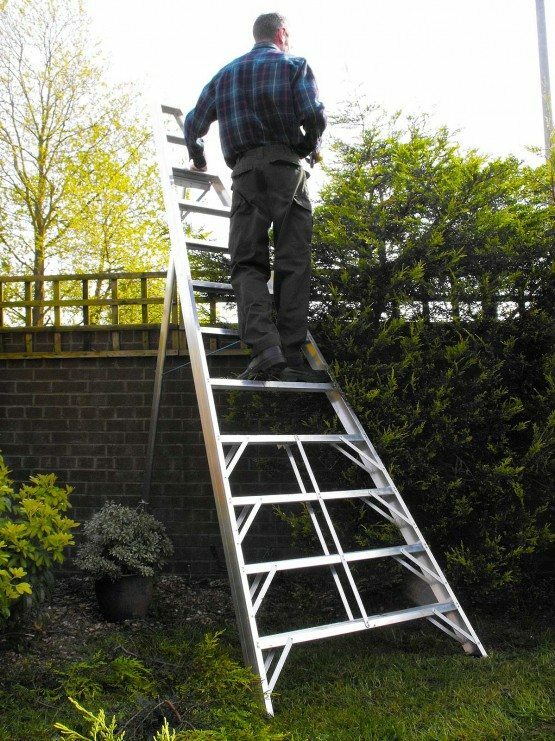 The All improved Maxi Range Aluminium Fruit Picking Ladders designed and manufactured in the UK by Chase Manufacturing. 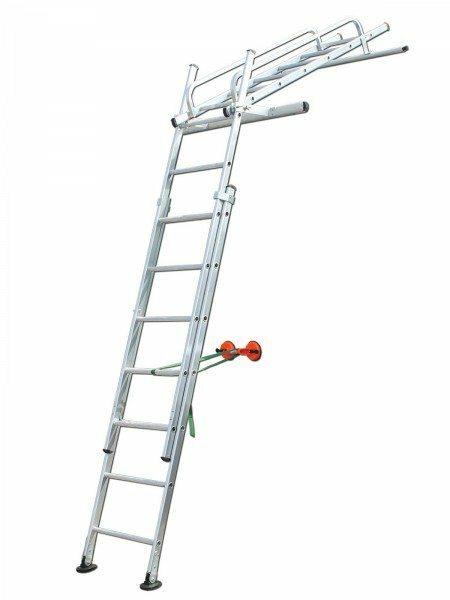 These groundsman tripod ladders are a safe and easy way to allow the user to work closely to hedges, bushes and trees and are intended for safe, stable access on soft terrain. The ladders are manufactured from heavy duty industrial quality aluminium with 80mm deep serrated flat treads and feature double riveted tread joints and a hinged rear leg fitted with articulated pressure pad and interchangeable ground spike. Now fitted the swivel pads to the front section. Optional Telescopic Rear Leg can be fitted at time of ordering if required. 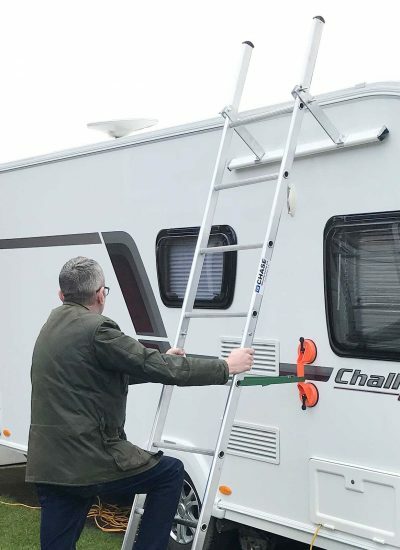 The Chase Caravan Cleaning Ladder designed and Industrial Quality manufactured in the UK by Chase Manufacturing. Designed specifically for Caravans & Motorhomes for cleaning & light maintenance. 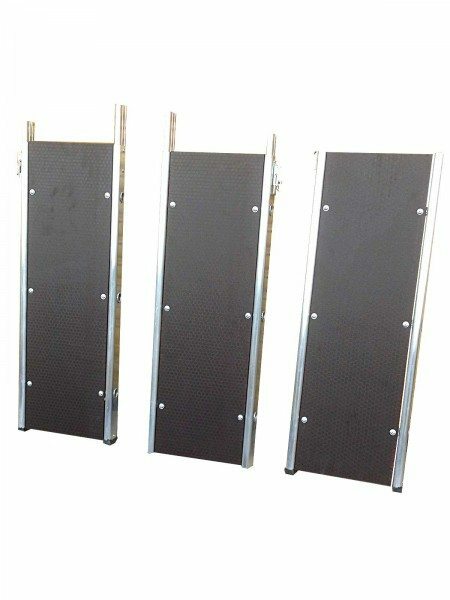 Provides exceptional stability & protects awning rail from damage by normal ladders. Featuring outrigger bars that easily adjust with sliding clamp-plates that pivot down to lock against ladder stiles. 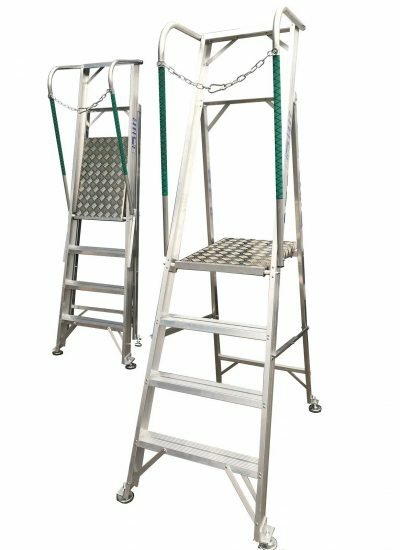 Supplied with suction pad & webbing strap to secure base ladder section and large rubber swivel feet. Ladder 2.8M Long x 0.5M Wide (Excl. feet). Supplied in two halves with socketed joint for easy storage - Secured with bolts and wingnuts. 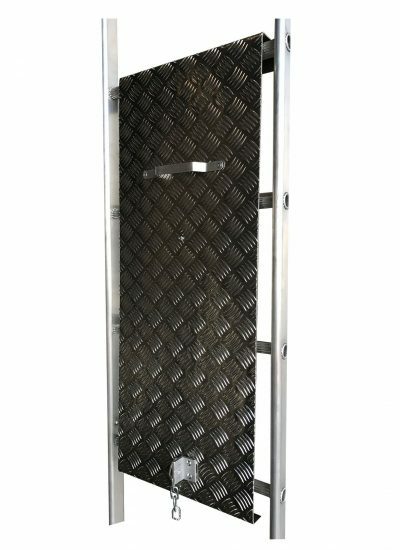 All-improved original Chase Ladder Sentry, now constructed from heavy duty aluminium tread plate. 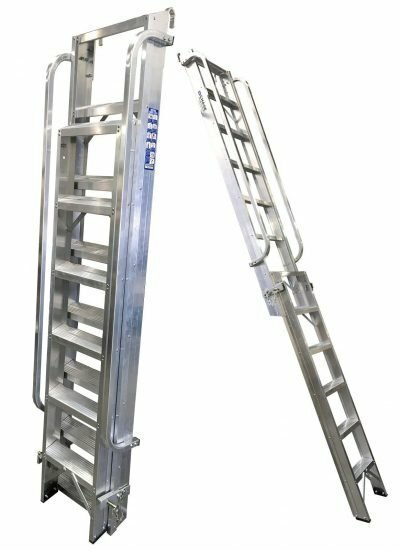 Industrial Folding Combination Ladder constructed in Aluminium and Powder Coated, designed and manufactured to the highest standards in Great Britain by Chase Manufacturing. Please be advised that we have discontinued the supply of "Switchback" & "SuperPro" powdercoated steps until further notice.We have a small number of powder coated components in stock for certain sizes. Please check with us before placing any orders for these products. However, we are still able to supply similar items in a plain mill finish aluminium. If you have any bulk requirements it may still be possible to supply as a bespoke order subject to quantity. 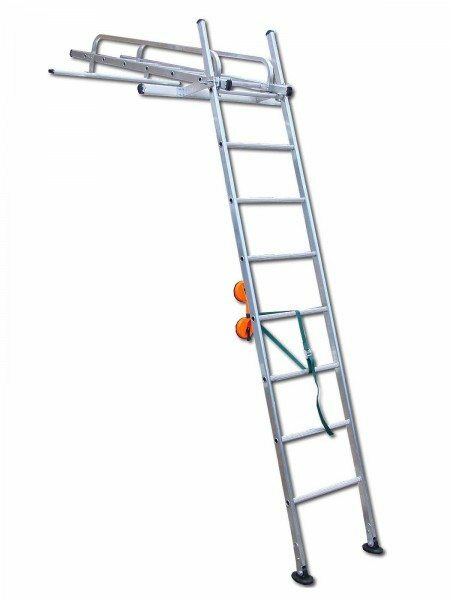 The Chase Switchback is a range of aluminium combination ladders designed & built to BS2037:1994 Class 1 Industrial standards with a 175KG maximum permissible vertical static load and a 130KG duty rating. The Switchback steps can be used as Free standing steps or use as a leaning ladder and benefit from Black powder coated stiles and rear legs, 80mm deep non slip treads one side for comfort and serrated round rungs on rear section. 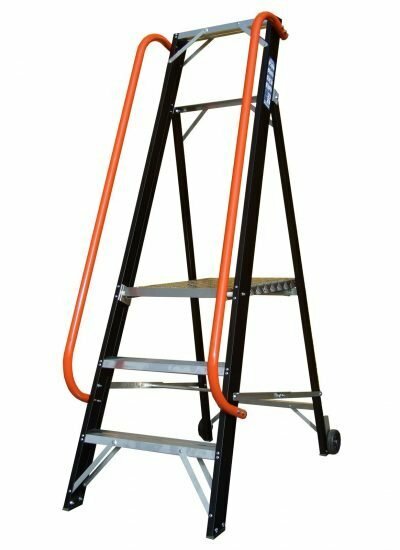 Strong oval box section stiles, Robust zinc plated steel locking stays and a tapered front section for stability make this folding combination ladder and ideal addition to any home, store or workplace with the top three 'No Climb' rungs powder coated orange. Introducing the all new DEKSTAR range of non-folding work platforms. Manufactured from an all aluminium construction-mill finish with 1M high handrails with safety chains to front & rear. 0.75M square tread plate platform deck and braked castors for easy manoeuvrability. Exceptionally stable and Rated to 175KG - single person use. Supplied fully assembled. The range features 5 platform heights ranging from 0.65m to 2.35m. Please Note that the prices quoted are based on collection from our premises. Should you wish delivery please contact us for a quote. The HOPSTAR - MINI Professional Industrial Folding Work Platform designed and manufactured in Great Britain by Chase Manufacturing. The smaller version of our hugely successful 600mm square folding hop up work platform. Now available with additional platform heights! Built from materials conforming to BS2037:1994 Class 1 Industrial and tested to a Maximum load of 175KG this 400mm wide x 360mm non-slip platform step is ideal for those little jobs that need doing around the workplace! The Hopstar Mini Folds flat and is extremely compact and features a fitted compact carry handle. Optional folding 760mm high handrail available at time of ordering. 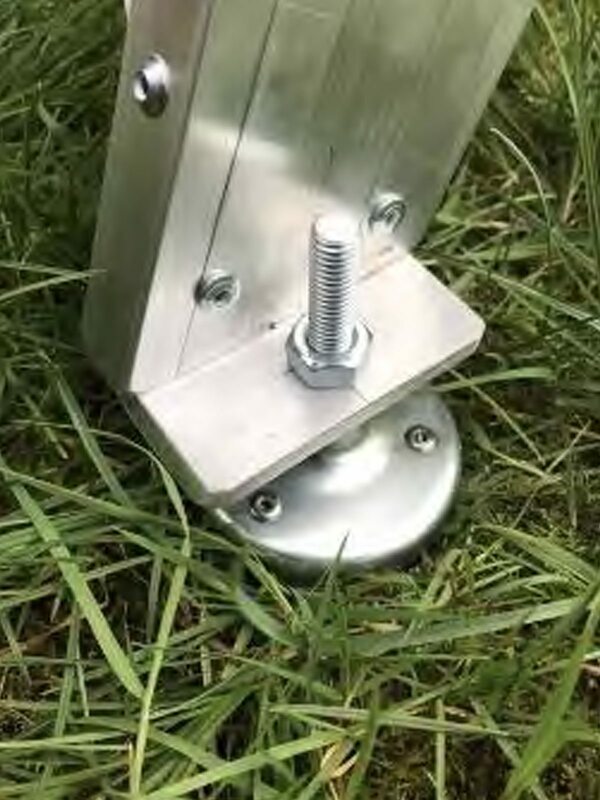 The Chase Utility Step designed and manufactured in the UK. A tried and tested Industrial quality double sided folding stepladder with a unique folding loop handrail. 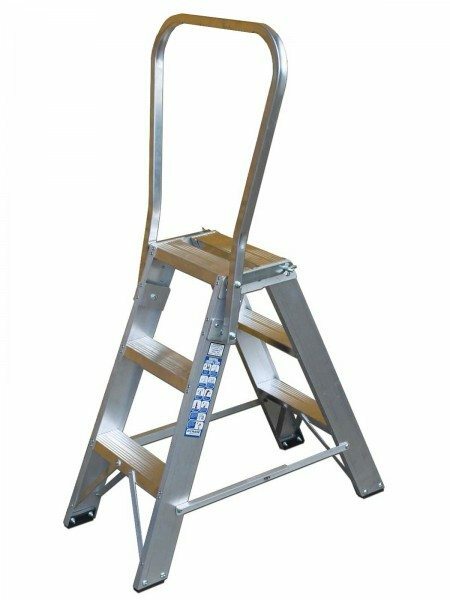 Originally designed for use by a major national utility company conforms to BS2037:1994 Class 1 INDUSTRIAL grade, Current HSE advice is not to use the top three treads on this type of stepladder - the handrail however allows this. Featuring double riveted, deeply ribbed non-slip treads, and compact enough to easily store in a car boot. Maximum permissible load 175KG. Height to top treads - 735mm, allowing comfortable access to most standard ceiling heights and weighs in at only 6KG! The Greenstar Work Platform Step DESIGNED AND MANUFACTURED IN THE UK BY CHASE LADDERS. A range of folding platform steps designed & built to BS2037:1994 Class 1 Industrial standards. Ideal for hedge trimming and pruning. Featuring Large swivel pads ideal for soft terrain as well as hard surfaces and a 175KG maximum permissible load (over-tested to 300KG). The Greenstar has a 400mm wide x 600mm deep platform, Unique X-GRIP non-slip hand rails with safety chain 1 metre high, 80mm deep serrated treads and a 1m high handrail from platform level. Portable Loft Ladders designed and manufactured in the UK by Chase Manufacturing. Fully portable, can be locked away to prevent unauthorised access. Industrial specification rated at 175KG built from materials conforming to BS2037 Class 1 Industrial grade with Mill finish aluminium. Locates onto pre-installed rail bracket, release locking pin and retract to floor level before re-engaging locking pin. Originally designed for a University campus with a number of loft hatches. 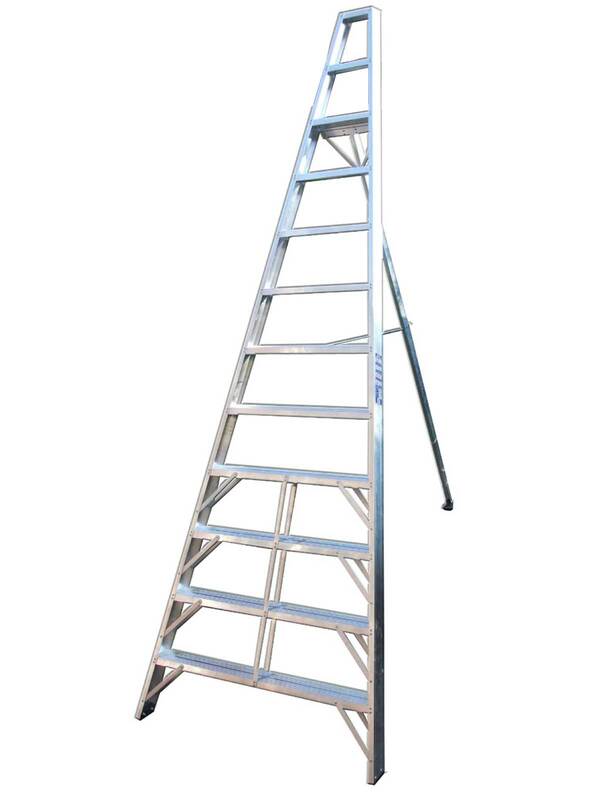 All needed a loft ladder suitable for use in a work-place environment by maintenance staff. Ideally suited for Hotels or large accommodation blocks. Please contact us for pricing as this is a made to order product. 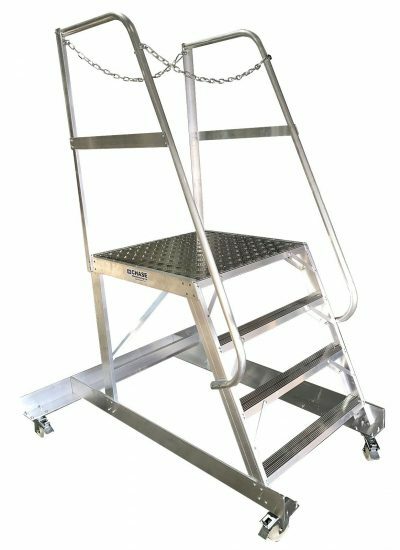 The Superpro Industrial Folding Platform Step designed & built in the UK by Chase Ladders. Constructed in Aluminium and Powder Coated. 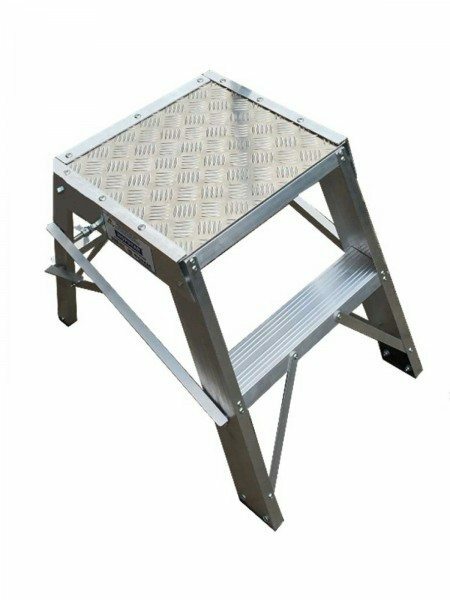 The Superpro range of folding platform steps is designed & built to BS2037:1994 Class 1 Industrial standards and features a 175KG maximum permissible vertical static load and a 130KG duty rating. The Superpro platform steps boast a Top tool tray to keep essentials handy and at a safe reach and are finished with a stylish Black & orange powder coating. 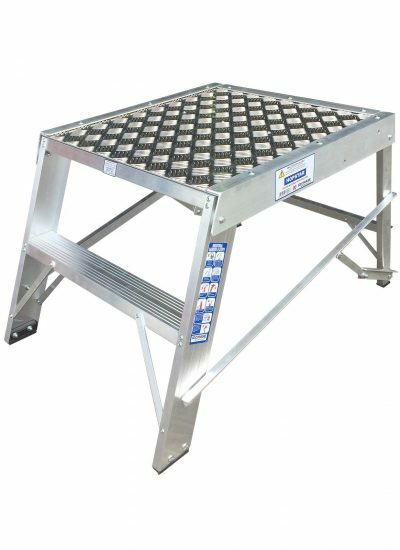 The Unique non-twist closing mechanism, Large 5 bar tread plate reinforced platform and 400mm wide x 600mm deep platform make this an incredibly sturdy work platform. The original Hopstar® professional Industrial Folding Hop Up designed and manufactured in the UK by Chase Ladders.